Reliving the Harry Potter High – Bookmarked! 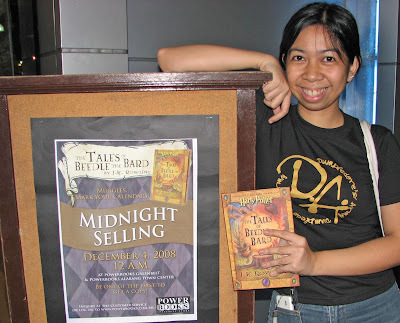 I felt a thrill running through me when I found out that there was going to be a local midnight release of J.K. Rowling’s latest wizardry book, The Tales of Beedle the Bard. Over a year after the release of Harry Potter and the Deathly Hallows, I numbered among the Harry Potter fans still hungry for more of the wizarding world and unable to find this kind of magic in other popular book series. Before the release, I’d already requested my sister in Singapore to buy me a UK edition of the book. 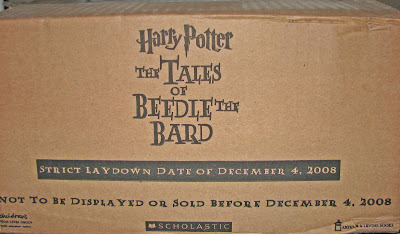 I’ve also spent months staring at the collector’s edition of Beedle the Bard day after day, hemming and hawing (until now) about shelling out $100 dollars for the coveted handcrafted tome. Wired for local news on The Tales of Beedle the Bard, I chanced upon Powerbooks’ site announcing the two-hour midnight release, I made a frantic phone call to my cousin Dianne, my partner-in-crime for Harry Potter hijinks. The midnight release was pretty tame in the comparison to the other crazy things we’ve done for the love of Harry Potter, including, but not limited to: making a complex paper-mache diorama of Harry battling the Hungarian Horntail for the release of Half Blood Prince; “forging” (and inventing) signatures of Harry Potter characters one afternoon when we were bored and had nothing to do; getting customized t-shirts proclaiming “In Snape We Trust” before the release of Deathly Hallows; attending the Deathly Hallows press launch as Luna Lovegood and Nymphadora Tonks in full costumes made from scratch and lining up at 6am the next day for the release of the book; throwing an all-out birthday party for Harry’s 27th birthday, and building up a collection of Harry Potter books in different languages. As the clock struck midnight, only a handful of people were lined up at the store, and we realized that this was the test of true fandom – we were among the very few who absolutely could not wait to get their hands on Rowling’s latest volume. 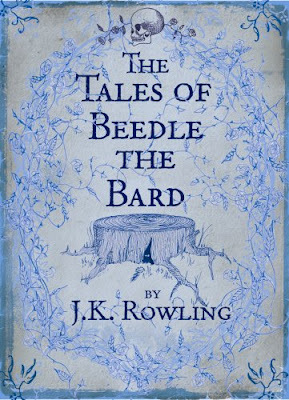 The Tales of Beedle the Bard is a canon within the Harry Potter canon, much like the previously released Hogwarts schoolbooks Quidditch Through the Ages and Fantastic Beasts and Where to Find Them. The book is a collection of oral tradition that exists in the wizarding world, with illustrations by J.K. Rowling herself. The translation of the book from ancient runes is credited to Hermione Granger, who received a copy of the obscure volume as a bequest from the late Hogwarts Headmaster Albus Dumbledore in Deathly Hallows. Now distributed in the Muggle world, the slim volume contains five wizarding tales written for young wizards and witches: The Wizard and the Hopping Pot, The Fountain of Fair Fortune, The Warlock’s Hairy Heart, Babbity Rabbity and her Cackling Stump, and the legend of the Peverell brothers and the Deathly Hallows, The Tale of the Three Brothers. “They have been popular bedtime reading for centuries… [and] are as familiar to many of the students at Hogwarts as Cinderella and Sleeping Beauty are to Muggle (non-magical children,” Rowling explains in her introduction. Like Muggle fairy tales, each story extols virtues and defames malevolence, serving as cautionary stories that wizarding parents used to instruct their children about the boundaries of magic. The stories also address relevant wizarding topics such as Muggle relations and intermarriage, love potions, and wandlore. Each story is annotated by Albus Dumbledore, whose notes on the book were among the many papers he bequeathed to the Hogwarts Archives. J.K. Rowling additional comments are added by J.K. Rowling to bridge the gap for Muggle readers. While the average reader can appreciate The Tales of Beedle the Bard, the book’s more significant nuances are reserved for the faithful Harry Potter readers, who will devour this hearty blend of wizarding lore. For those who haven’t quite gotten over the tragic events at the Hogwarts Astronomy Tower, Beedle the Bard embodies the ultimate Albus Dumbledore fix. Dumbledore proves to have been right when he posed the question “You think the dead we loved ever truly leave us?” as his quirky annotations bring him back to life, revealing both his scholarly findings and candid personal recollections. Rowling states that the notes were completed around eighteen months before Dumbledore’s demise, and it is unclear whether they were written for his own satisfaction or for public consumption, but they reveal another important key to Dumbledore’s identity – the side of his personality that he carefully concealed: his flamboyance, his self-importance, even traces of a more sinister bite. The slim volume also packs heady nostalgia and new revelations for the Harry Potter reader, who will appreciate Dumbledore’s anecdotes on familiar characters from the series, with revelations on how Nearly Headless Nick came to the chopping block; the Malfoy’s long running campaign against Muggles; why pantomimes are banned from Hogwarts; Professor McGonagall’s reasons for becoming an Animagus; Professor Kettleburn’s reckless career as the Care of Magical Creatures professor; and even Aberforth’ s favorite bedtime story. 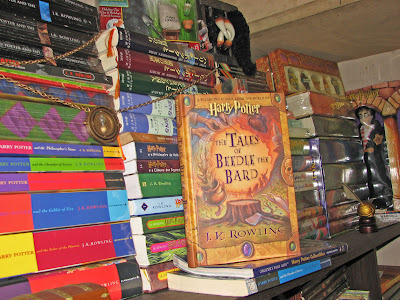 Marking another chapter in Harry Potter fandom, The Tales of Beedle the Bard stands as the first measure of the longevity of the concluded series, separating the true Harry Potter fans from those who only watched the movies, or read the books just because everyone else was reading them. J.K. Rowling has given her fandom their Christmas gift, and I join the legions of fans around the world who will read the book again and again, fueled by new points for discussion, to relive the magic that Harry Potter that has brought into our lives. i bought it for the little ‘un for xmas – she was THRILLED to say the least. wow, a fellow HP fan! and so young! Pingback: The Harry Potter Obsession… er, Collection | Bookmarked!